I was listening to a lot of specialist soul shows on BFBS and Radio Luxemburg in the early to mid 80s. There was also a weekly show on Tuesdays (or Thursdays) out of Brussels called “Funky Town”. The reception was pretty bad but I remember trying to soak up every note, every groove since this was a programme which played music you couldn’t hear anywhere else. And it was in the hot summer of 1983 when I first heard “(Do You Really Love Me) Tell Me Love” by Michael Wycoff. It was culled from the third and final album by Mister Wycoff called “On The Line”. The a cappella intro was sung by the same gang who used to grace the Luther Vandross albums and which you could instantly recognize: Tawatha Agee, Brenda White, Fonzi Thornton, Phillip Ballou, Michelle Cobbs. The bass and keys shuffled along gracefully on this nearly 8-minute long masterpiece which also featured some soulful piano solo work by Michael himself and superb production work by Webster Lewis. And those strings. Real strings. Arranged dramatically by Lewis, they complemented the vocals and the story in grandiose fashion. It still sends chills when I listen to it now, over 35 years later. The piece remains one of my all-time favorite tracks. 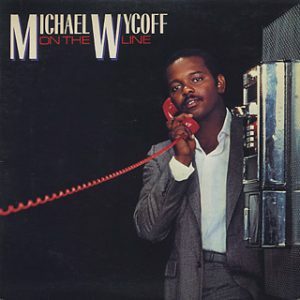 Michael Wycoff’s name first popped up on Stevie Wonder‘s epochal “Songs In The Key Of Life” album and I first encountered this ultra soulful and sensitive voice on a dance tune called “Still Got The Magic” in 1982. Soon after I got hold of the original 12″ record of “Tell Me Love” in August, 1983 in Cologne, I found the accompanying album at a flee market store in Camden Town in London (Reckless Records) and later bought his first two albums, “Come To My World” (1980) and “Love Conquers All” (1982) in Amsterdam at M.M.C. Import. “Love Conquers All” also featured the amazing “Looking Up To You”, co-written by Leon Ware, which in the 90s became very popular because the group Zhané sampled the tune in 1993 for their hit record “Hey Mr. DJ”. And Michael’s third album also had two songs written by the incomparable Gary Taylor, the title track “On The Line” and “Do It To Me Baby”. During the time of his third release, there were a lot of stories about his alcohol and drug addiction which later found him without any record deal and homeless. But he was able to beat his habit many years later and became a minister of music at several churches in the LA area. And in 2007, he began to record songs with producer Robby Robinson for an album to be titled “Return” which was actually never released. Michael Wycoff was only 62 years old when he died last Wednesday of pancreatic cancer. Rest in peace.